Today was a rainy one so it became a good day to pack up some seeds. As plants finished last year I collected seed and let them dry. It was time to look in the bin to see what I had to share. Not only do I collect seed, I buy my fair share wouldn’t you say? It’s an addiction. I can’t resist and don’t want to try. Seeds are so amazing! It’s hard to believe something so tiny can feed us all. Ladner Seedy Saturday is next month and I want to have some seeds to trade at their seed swap. Have you been to a seed swap before? Many people haven’t. It’s just what it says, a swap where people bring seeds to trade with each other. So this afternoon I sat inside and packed some Marigold seeds into coin envelopes. Coin envelopes are the perfect size for seeds. They are about 2″ by 3″ so there is room to write the name of your plant on the front along with some growing details. It’s important to bring your seeds packaged to a seed swap. Its easier for all. The Ladner Seedy Saturday & Garden Expo 2016 is being held on February 20 this year. I can’t wait to trade some of my collected seeds at the seed swap. I know its important to package them in small quantities so I placed about 60 seeds in each package. 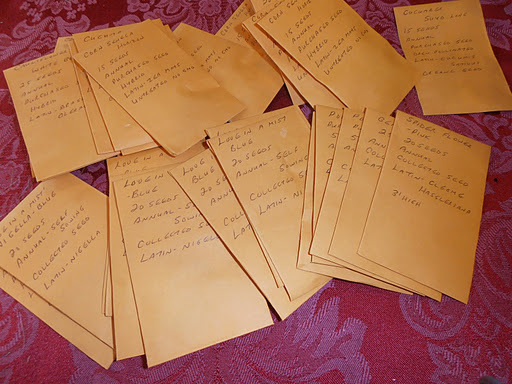 Last year the seed swap was very busy. You need to drop your seeds off at the seed swap between 10:00am and 10:30am so the volunteers can get them organized. You get a ticket for each package of seed that you bring in. The seed swap opens at 10:30am and you can use your tickets to get seeds. It’s so much fun to see what everyone brings to trade. If you have seeds for a vegetable, flower or herb that you didn’t like, now is the time to tape it shut or repackage them. Everyone likes different plants for their garden so trading makes it fun ad you go home with something you like. The Ladner Seedy Saturday & Garden Expo is being held at Harris Barn, 4140 Arthur drive in Delta, British Columbia. For more information on the event check out the Ladner Community Garden site.